Are you for or against the (1) altar call, (2) sinner’s prayer and (3) reasons not to ask Jesus into your heart? Thousands of evangelism tips - Stumped about how to share your faith in Christ with others? EffectiveEvangelism.com, a ministry of ChristianAnswers.Net, assists Christians in effectively reaching out to others with love and truth. Learn about the worldview of your audience, ways to share the gospel, read stories submitted by site users, and more. 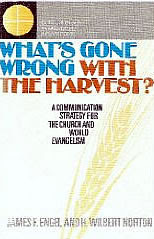 James Engel wrote a book in 1975 which profoundly changed many people’s idea of evangelism, entitled “What’s Gone Wrong With The Harvest? A Communication Strategy for the Church and World Evangelism” (published by Zondervan). 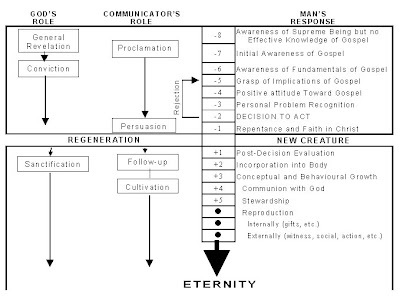 The Engel Scale has been used to introduce many Christians to a new understanding of evangelism. In the past, people have often seen evangelism only in terms of people being converted. Understood this way, most of our evangelism must be counted as pure failure. Few people can live with that level of failure, and few survive as evangelists, or even as effective witnesses, for long. The Engel Scale completely changes this picture. If you understand something of the journey a person must take in order to discover God, then you know that helping someone take one more step towards God is successful evangelism just as much as helping them over the final line. The Engel Scale helps people to understand this journey. Evangelists have long known the truth of this, but it has not often been taught and understood. Almost everyone who makes a commitment to Jesus has a story to tell of people and events in their lives bringing them closer and closer to the point of total surrender. Some figures indicate that the average length of the journey, from the time people start looking for God to the time they find Him, is four years. However reliable that figure, and whatever it means, it is clear that for most people the journey to God is a long one. Engel promoted a revolution. Not Engels the Marxist thinker, but James Engel the missiologist. He first outlined what has become known as the ‘Engel Scale of Spiritual Decision’. This describes the way in which an individual, or by extension a whole group, progress in their understanding of the Gospel, as God’s sovereign grace begins to illuminate their hearts. By understanding the way God communicates, we can become better co-communicators. Others have suggested different refinements of the Engel Scale. Frank Gray of FEBC Radio, has proposed a horizontal axis of antagonism/enthusiasm to create the Gray Matrix. It is a remarkably simple but enlightening concept because it helps us to visualise important evangelistic concepts. Christian evangelistic communication has often failed to touch people who are low down the scale, because it has been presented in Christian language and thought-forms and has not engaged with those it was intended for. The tragedy is that so often, evangelism is only touching the ’once-churched‚ (those with some Christian background) rather than the ’never-churched‚ (those who know nothing of the Gospel at all). The lower-left oval shape represents a person or group of people who are fairly resistant and lack knowledge. The challenge to us is always to use approaches which reach down as far as possible into the bottom left-hand corner! The lower-left purple oval shape represents a group of people who are fairly resistant and lack knowledge. Our challenge is always to use approaches which reach down as far as we can into the bottom left-hand corner! Effective evangelism not only requires people to obtain more knowledge – they must also move from a position of antagonism/indifference to a more positive viewpoint. They are unlikely to wish to find out more until they view Christianity more positively. Anything which moves people from left to right across the scale is ’evangelistic’. This might include acts of service and friendship, mum and baby clubs, medical and development work – many things which are not apparently 'preaching' but which minister to felt needs. Yet in fact, the word Jesus used when he told us to ’preach the Gospel‚ has a much wider meaning than speech – it refers to communication. (There is a Christian debt-counselling service in UK, where 80% of those helped are eventually converted.) For some people groups, apologies offered for the past historical actions of groups perceived to be ’Christian‚ are also healing hurts and reducing antagonism to the Gospel. Relationships are a key to helping people up the scale. Modes of evangelism which do not at some point connect not-yet-Christians in ongoing relationship with Christians, are unlikely to be fruitful. Research has shown that in lasting adult conversions, they reported a spiritual journey taking on average three years to commitment, and the most important factor in that period was a relationship with a praying Christian, who modelled faith to them: more. If we can understand roughly where a single person or target group of people is situated on the scale, we can choose an appropriate approach to reach them – and we will need to understand their culture – how they really feel, think, and react. If people are near the bottom of the scale, we must not use Christian language and ideas which will mean nothing to them. In fact we must assume they have zero knowledge. We must assess our message through their eyes, not ours. It may also be inappropriate to give a heavy ’preach for a decision‚ at this point. People need time to progress and understand. Instant conversions are rare. A style of presentation which bases everything around 'praying the prayer' without true understanding or preparation is counter-productive. We must also be aware of ways of presenting Christian content which is intensely annoying. Instead, an enticing style of permission evangelism may well be the most effective. The Matrix illuminates the importance of using Bridge Strategy web-pages. It also allows us to define the positioning of any Christian website, on the X-Spectrum. It also validates the use of ’Chronological Bible Storying‚ [Ref 1] [Ref 2] used in many situations where the target group have zero knowledge of the Bible. It also highlights the need to contextualize the message to make it easier to understand for those with no biblical knowledge. Pressures of society and culture, and the strategies of the Enemy, will tend to pull people down towards the bottom left-hand of the scale. God's purpose is to draw people to the top right-hand side by His Spirit, through the witness of his people. These vital issues of how to communicate the Gospel to people at different levels of understanding, in a local church situation, are covered in several of our book recommendations. It is also very important to understand the ways that people actually learn anything because these closely parallel the way people gain (or fail to gain) spiritual understanding. These principles have important implications for every sort of outreach including Web evangelism. An apologetic approach can be part of effective communication. Why we need strategies for evangelism – surely we are just called to preach the message? Thirteen keys to Christian ministry [www.donaldmillerwords.com/pdf/thirteenparadigmshifts.pdf] – 13 insightful and biblical principles on how we should relate to non-Christians in ministry.